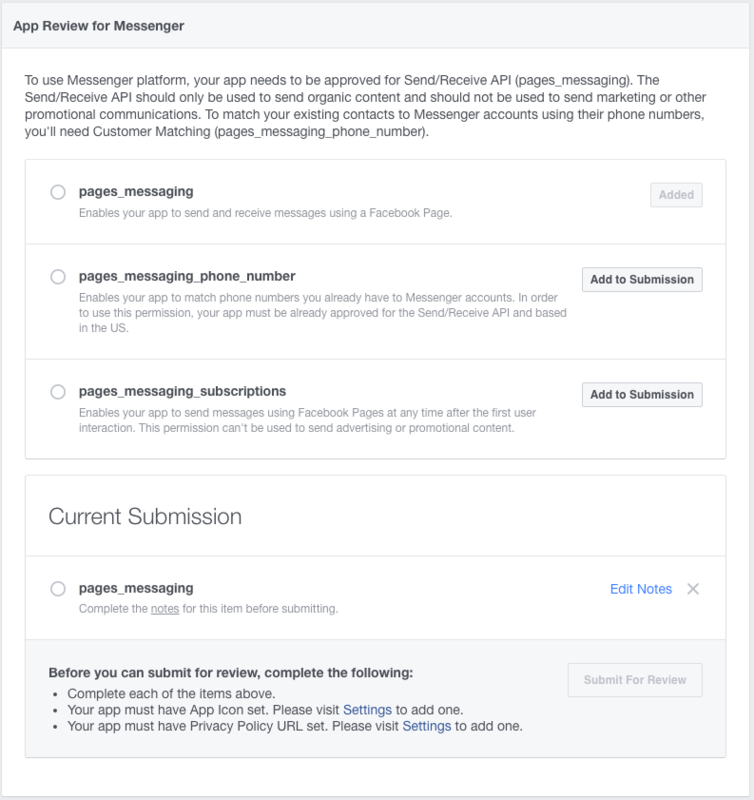 The first things you need in order to send a notification is a Facebook page and an app. You can create a page in the top right corner of your Facebook profile. Take a note of your App ID, we will use it later. 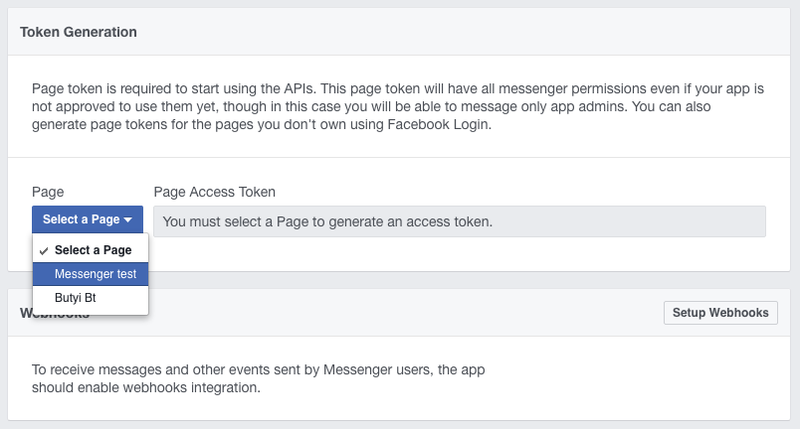 Generate a Facebook access token by selecting your Facebook page in the Token Generation section. Take note of your Access Token you will need it soon. Add pages_messaging permission request to your submission. You do not need to submit your app for review but you do need to add this request to your configuration. Open the Channels Catalog in the Twilio Console. Under Credentials Select the Facebook page you want to use from the drop down menu. 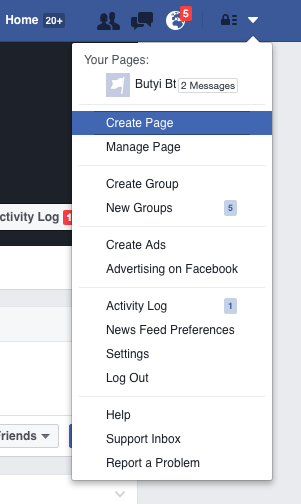 If you do not see your facebook page that you just created, click the Logout button on the Console page to logout Twilio from Facebook and then log back in again to Facebook. Click Save at the bottom of the page and you have connected your Twilio account to Facebook Messenger. We will create a single webpage that will have the Send to Messenger button on it. When the user clicks the button Facebook will call a webhook of ours and we will create a Binding in Notify to store the user id of the user. This is one of the many ways to acquire user consent for sending Facebook messages. A Binding is a combination of a user and device that can receive a notification. For Messenger notifications, all you'll need is a user's user id to create a binding for them. 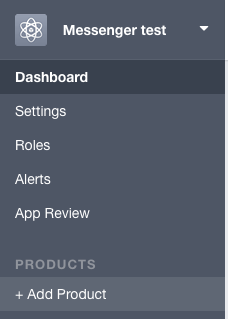 Important note: If your app is not yet approved for using Messenger (most probably the case) then you will need to be logged in to Facebook and be an admin, developer or tester of the app to see the button. Unzip the app you just downloaded, and navigate to that folder in a Terminal window on your Mac. You'll need to install Node.js if you haven't already, you can do that here. Now, we just need to configure and run the app. In the terminal, copy the .env.example file to .env. Edit the .env file to include your configuration parameters: - Twilio Account SID and Auth token can be found in the Twilio console. - Twilio Notify Service SID can also be found in the console. Open https://<YOUR SERVER>/notify/facebook_messenger.html in your favourite browser and click Send to Messenger. You should see in your server's logs the webhook request from Facebook and the Binding resource created in Twilio. Take note of the identity attribute of the Binding. You can use that to send notifications to it. In the sample app we have set it up so that it uses the Facebook user's id. Please do not use any personal information (such as name, email address, phone number) for the user identity in your application. To send a notification we simply make a request to the Twilio Notify REST API with the content of the notification we wish to send and the identity. In our case this is the id of the Facebook Messenger user we want to target. No database queries or state management on our end - w00t! You can use the /notify/ page in the web application to send a message to this user. Just use the numeric Facebook messenger user id as the identity in the text box. To get that id, check the logs of your server application, it will be part of the binding. 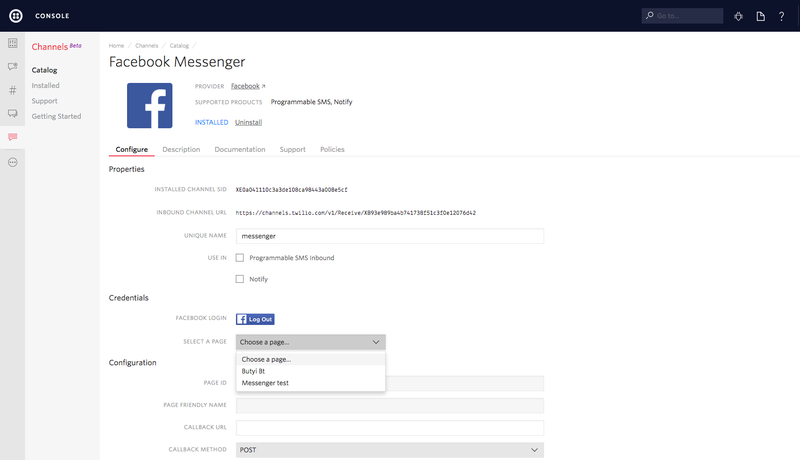 You will get a Facebook messenger notification from your page with the hardcoded 'Hello World!' message! There are other ways you can use to acquire a user id, like by receiving a message first from a user. Check out Facebook's guide on entry points to learn more. Also there are few terms and conditions you need to adhere when engaging users via Facebook Messenger. Please, check out the platform policy before submitting your application for review. Finally, there's much more you can do with Notify, like alerting users on different kinds of devices or notifying a segment of your users in a single API call.